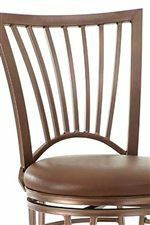 The Baltimore Swivel Counter Chair with Slat Back by Steve Silver at Walker's Furniture in the Spokane, Kennewick, Tri-Cities, Wenatchee, Coeur D’Alene, Yakima, Walla Walla, Umatilla, Moses Lake area. Product availability may vary. Contact us for the most current availability on this product. Bring the feel of a cool urban bar into your own home with the sophisticated array of bar stools the Baltimore collection has to offer. 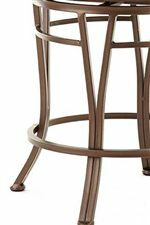 Fully welded frames with slatted backs, splayed legs, and circular stretchers establish modern silhouettes for this group of counter and bar height stools. A scratch-resistant electrostatic finish is used on each piece for extra durability, and each bonded leather stool seat comes equipped with a heavy duty 360 degree swivel mechanism that allows you to move about with ease. Complete your home bar space, pub dining area, or breakfast counter with the sleek, sophisticated high-top seating options from the Baltimore collection. The Baltimore collection is a great option if you are looking for Contemporary furniture in the Spokane, Kennewick, Tri-Cities, Wenatchee, Coeur D’Alene, Yakima, Walla Walla, Umatilla, Moses Lake area.